I don't know whether you know Mariposa. If not, it is of no consequence, for if you know Canada at all, you are probably well acquainted with a dozen towns just like it. "The Hostelry of Mr. Smith"
That night Pupkin walked home on air and there was no thought of chloroform, and it turned out that he hadn't committed suicide, but like all lovers he had commuted it. And, as we listen, the cry grows fainter and fainter in our ears and we are sitting here again in the leather chairs of the Mausoleum Club, talking of the little Town in the Sunshine that once we knew. "L'Envoi. The Train to Mariposa"
Stephen Leacock gets compared to Mark Twain all the time, which is a pain because then people like me have to keep pointing out how different he is from Mark Twain. We have to keep pointing to Sunshine Sketches of a Little Town and showing how kindly the townsfolk are satirized, compared to Twain's barbs in Tom Sawyer or Huckleberry Finn. Twain had racism and class prejudice to deal with, while Leacock's Mariposans are a placid United Empire Loyalist lot. But the differences go beyond the sharpness of the attack. Leacock was undoubtedly inspired by Twain whom he admired greatly. But the writing style is different. The humour is different. The stories are much different. Firstly, Sunshine Sketches of a Little Town delivers on its title. It is a series of sketches—short stories—that overall give a picture of the town. 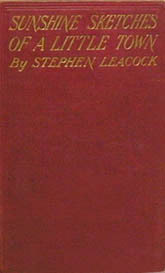 Apparently Leacock kept striving to write novels, but despite his efforts his books remained, at best, linked and overlapping stories. This is not necessarily a bad thing. Leacock's sensibility is perfect for stories. He's not after a large statement about life or society or the development of some individual through a life-changing series of adventures or crises. In fact, it's important his characters don't develop much, for he's giving a picture of human nature frozen in a certain time and place, saying, "See, how like us all in any time and place this is." Mariposa gives him a small, controlled laboratory removed from the rest of the world for his delving into human nature. Not that Leacock ever thought of it in these grandiose terms. I'm sure he just felt a hankering to write about the characters who inhabit small Canadian towns. But this grand result is in effect is what he accomplishes. Take the narrator. Twain often introduces a work in his own voice but soon gives way to his characters. In Sunshine Sketches Leacock is a character himself throughout. Not a character with a name or role in the action. But as narrator he's one of the townspeople who has left Mariposa, yet still visits, and when he does visit, even if just in imagination, he's one of them again. He shares the townspeople's enthusiasms, their delusions and their disappointments. A joyful part of the game of reading Sunshine Sketches is reading between the lines to figure out what our unreliable storyteller is missing, what is really going on. It's not that difficult, as the irony is extremely broad. We gather that while the town's financial whiz, Jefferson Thorpe, the barber, is rising in the eyes of his customers (and the narrator) to the level of the Rockefellers, he's really being swindled by big-city crooks. We quickly figure out the apparently wildly successful fundraising campaign for the church is actually losing money. But the fundraising story concludes sweetly despite the campaign's utter failure, and then a plot twist takes us completely by surprise. We wise guys who knew better than the small-town hicks may have been missing Leacock's point all along. Same with the famous tale of the sinking of the Mariposa Belle—it turns out the story being told was not what we had thought. There are no really bad characters in Mariposa. Oh, there are blowhards, and cunning politicians, and self-interested businessmen and the usual run of ne'er-do-wells you'll find anywhere. But they're all part of the human comedy, nobody really nasty. Leacock isn't railing against the world or against man's inhumanity to man or against an unjust system, as Twain is wont to do. He's just enjoying humanity with all our foibles. And making us laugh at ourselves. Despite the conceit, winkingly encouraged by the author, that we the readers are more sophisticated than the bumpkins of Mariposa, the fact is that we wouldn't appreciate the satire nearly as much if we didn't on some level see ourselves in them.